Golden hour is special for any place with picturesque scenic beauty, especially if you also happen to like photography. There aren’t many places more stunning during the golden hour — that time right after sunrise and right before sunset — than Bryce Canyon. There are even viewpoints named for these wonderful times… Sunrise Point and Sunset Point. So how about a trail that goes from one to the other while also diving down amidst the wondrous hoodoos and pine forest that give Bryce Canyon its majesty and character? That would be Queens Garden. My brother Dave and I hiked the Queens Garden Trail on Sunday, June 3, 2018 beginning at 6:00AM and finishing about 8:45AM. Our plan was to start at Sunset Point, crossing the Rim Trail over to Sunrise Point, arriving before dawn. As the sunrise began we would descend Queens Garden Trail from Sunrise Point, taking the loop in a clockwise direction. We would climb back up out of the hoodoos to Sunset Point, completing the loop. Hike Rating: Moderate. Climbing back up out of the hoodoos requires some exertion. Trail Condition: Very good. Hard pan consistency. Can be muddy when wet. Starting Point: Sunrise Point along the Bryce Canyon Rim Trail. Trail Traffic: We were the first on the trail before dawn, so we had the descent to ourselves. The ascent was another matter. There were likely a hundred or more coming down as we were going back up. How to Get There: From Ruby’s Inn, UT take Hwy 63 into Bryce Canyon National Park. There is an entrance fee required. Turn left off the main road at Bryce Canyon Lodge. Find parking, then walk to Sunset Point. Follow the Rim Trail to Sunrise Point. The trailhead for Queens Garden is on the left just below the overlook. The crowd was beginning to arrive already as we walked the half mile from Sunset Point to Sunrise Point in the daybreak twilight. It’s a daily ritual at Bryce Canyon as the tourists, campers and hikers all arrive before dawn for the light show that turns the world famous hoodoos from grey darkness to bright orange. There were perhaps as many as two dozen already there when we arrived at Sunrise Point. Mostly dressed in jackets and hats for the morning chill at 8,000′, many would go back to their campfires for breakfast as soon as the sun broke the horizon. Dave and I already had ours and we started down the Queens Garden Trail right away, hoping to beat the rest of the hikers, and to find a dazzling view spot farther down into the canyon. Our plan worked, as we didn’t see another hiker for at least the next hour. Bryce Canyon is brilliant enough in the middle of the day. I’ve now had the opportunity to experience a sunrise amongst the hoodoos twice. It simply takes your breath away. Consider every shade of pink and orange imaginable. The shadows on the tall pines and the taller hoodoo spires are long. Everything surrounding you begins to glow during the golden hour. The sky is a cerulean blue. The moon hangs above the cliffs of the canyon rim. The chipmunks chatter. Birds form a chorus. Deer scamper and graze. The breeze whispers through the canyon passageways. Everything is in unison as it welcomes and delights in the promise of a new day. I felt privileged just to be there. As you plunge deeper and deeper into the canyon you are surrounded by hoodoos on both sides. If you don’t know, hoodoos are tall skinny spires of rock that protrude from the bottom of arid basins. They are created over many centuries through slow erosion of the soft rock and dirt sediment layers. Here in Bryce Canyon their color tends to be mostly various shades of orange, but there are some with more of a whitish or pinkish hue. The forest that grows in the canyon is evergreen. It is a combination of juniper, ponderosa pine and the ageless bristlecone pine. A few wildflowers manage to bloom sporadically on the otherwise barren dirt. When you reach the bottom of the trail after about three quarters of a mile, there are white and pink and orange and red mounds of dirt interspersed among the hoodoos and pines signalling the entrance to what is known as Peekaboo Canyon. You can hike down in there. Dave and I talked about doing just that on a future visit. This is the scene at the entrance to Peekaboo Canyon. Once you reach the bottom of the canyon, the trail is like a maze through a series of passageways, curling in, around, and among the towering hoodoos. In a couple of places where you would otherwise be stymied by limestone walls, the trail builders have carved short tunnels through the stone. At 0.8 mile you reach a short spur trail that takes you to what is known as Queen Victoria’s Garden, a collection of hoodoos that are clustered together between two hills. At one time, decades ago, one of these hoodoos looked eerily similar to a statue of Queen Victoria found in England. Over time, though, erosion has continued to do its own sculpting on the hoodoo, so you really have to use your imagination to conjure the namesake. The next couple miles of trail wanders among more hoodoos and follows a wash through the forest. Keep your eyes peeled for wildlife in this area. There is more vegetation for them to feed on. The hiking is easy as the trail is mostly level. We found a log bench to take a brief break, and were greeted by chipmunks who wanted to share our snacks. By now, a couple hours into this hike, we were beginning to see other folks. A few had caught up from behind, but most of them were coming down the other side of the loop. We went a bit farther and came to the junction with the Navajo Trail. It had been our original plan to take that to complete this loop hike, but it was closed for repairs. So we began the ascent of the south side of Queens Garden Trail. As you start the ascent, the hoodoo walls get tighter and tighter. The trail becomes almost like a slot canyon. There isn’t much light. The trees are few, and the tread is dustier. We reached a feature known as Two Bridges, an alcove where twin natural bridges span a gap between hoodoos. Soon after, the climb back to Sunset Point begins in earnest. There is a series of about a dozen switchbacks that takes you between hoodoo walls. The crowd of hikers was really coming down the trail now as we were within a quarter mile of the rim. After clearing the switchbacks, you pop out into the bright sunlight of the Bryce Amphitheater. The orange glow from the hoodoo pipes and spires seems to permeate your senses. Across the way a lone mule deer was in peaceful repose in a gap between the towers, completely oblivious to the crowd of humans in proximity. She too was reveling in the splendor that is a Bryce Canyon morning. We reached Sunset Point. The view over the south side into the Silent City collection of hoodoos was stunning in the early morning light. We stared at the scenery for 10-15 minutes. It wasn’t even 9:00 yet. As we sauntered back to the car, we still had nearly the entire day to look for other adventures at the wonderful Bryce Canyon. Summarizing Queens Garden Trail, this is an excellent means of “walking among the hoodoos.” While there is some exertion involved to climb back out of the canyon, it isn’t too tough. Take your time. 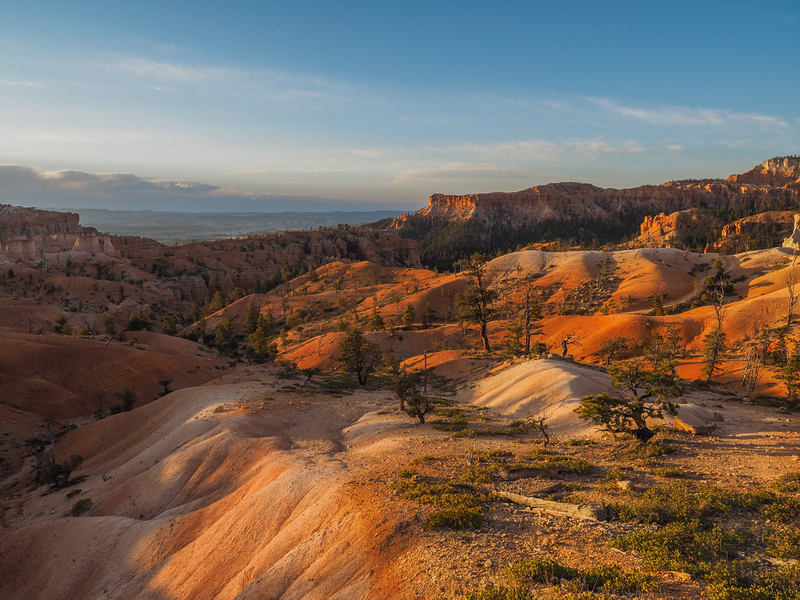 This entire loop can be hiked in less than three hours and offers a stimulating Bryce Canyon experience. You can make it even that much more enjoyable by checking it out at sunrise. I hope you enjoy the photos below. I especially liked putting this gallery together.